10) He chewed an entire can of chewing tobacco at once, at all times. 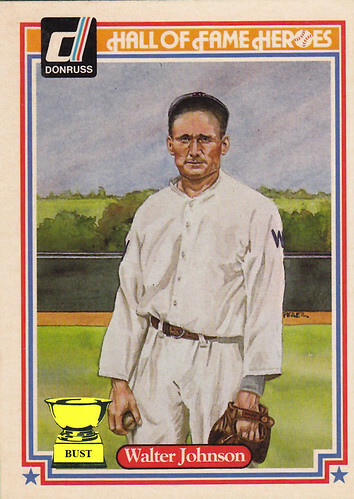 9) Because he pitched from 1907 to 1927, it makes sense to make him look 147 on this card. 8) His hat had no brim; his head, no hair. 7) He played baseball in a bountiful land of no buildings. 6) He nicknamed his bulge the Roaring 20, then changed it to Walter Johnson Jr.
5) He had as many chins as years played. 4) Part man, part horse, all mean. 3) Career numbers: 5,712 complete games, 1.4 million innings pitched, dead at 39. 2) He wore your mother's bed sheets as his uniform. 1) His fastball caused the Great Depression.